The opening session began with a presentation by IT for Change. To set the context for further engagement and discussion, a snapshot of the latest developments in digitalized welfare and data, in and for, governance, along with some possible directions for policy measures from other nations were presented to the group. Several ideas and contestations around digitalized welfare service delivery, citizen engagement and data governance were discussed. At the end of the presentation, two key questions were presented to the group to take forward the deliberations for the rest of the day. What should a digitalized service delivery model that guarantees democratic accountability look like? How can legal-institutional systems for data-in-governance and data-for-governance be designed to ensure public interest and the promotion of people’s rights? The presentation was followed by a round of inputs and reactions from the participants on the current state of digitalized welfare and the ways in which exclusions were playing out. 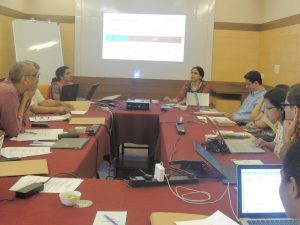 From the ways in which the Aadhar architecture is embedding itself into the welfare system and creating multiple forms of ruptures, to the wild-west regulatory environment that current data governance systems operate in, participants spoke to these themes from their backgrounds in legal research, civic activism, digital policy research and administrative experience. A wide range of accountability concerns about the digital governance systems were debated and discussed, in the following sessions on digital welfare and data in and for governance. The round table also allowed for articulation of next steps in the process, which started with the November workshop and the creation of the charter on democratic accountability in December 2016. 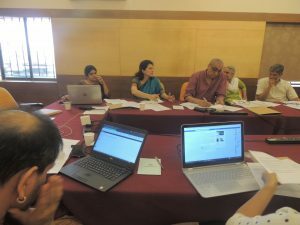 Several participants brought up the fact that despite evidence about the many irregularities in the Aadhaar system, challenges to it were being summarily dismissed. Further, deliberate campaigns of misinformation were being used to push it as the core platform for governance. Not only was data within the Aadhaar system being linked to more and more welfare systems, but this data pool had become the default property of the state. Further, the welfare system itself was being weakened by a breakdown in service delivery through a replacement with cash payments, thus ending government intervention in vital sectors such as education, health and pensions. The issue of unproblematic surrender of biometrics to the state was also raised in the round table. In the context of some data governance laws introduced in the presentation by IT for Change, such as the European Union’s Right to be Forgotten, it was observed how even the digitally active and those with skills to understand or grasp some part of these safeguards were often unaware of their rights, and the full implications of what the trade-offs were when they ‘bought into’ the digital. How could the marginalized then grapple with the complications of being online? The lack of choice with which citizens were being forced into these things is a matter of concern, observed Nikhil Dey from the Mazdoor Kisan Shakti Sangathan (MKSS). He noted that the idea of good governance used by the World Bank, has imposed a notion of ‘good’ that becomes automatically associated with ‘efficient’. The real test is of ‘democratic governance’, which hinges on whether governance is participatory, whether it offers real choice and whether the platforms it uses can be subject to audit. The issue of demonetisation, the budding financial technology industry (fin-tech) based on the Aadhaar platform and the aggressive cashless agenda of the Indian government were also discussed in the round table. Anjali Bhardwaj, director of the National Campaign for People’s Right to Information (NCPRI), spoke to the larger question of citizenship in the times of digital governance and the manner in which it created codes of legitimacy and illegitimacy. She brought up the case of the slums of Delhi where NCPRI worked, where residents were constantly told from the very beginning, “you are illegal.” Control over people’s proof of identity was very common, and local power brokers would just collect voter cards before elections. This alienation was only getting worse and becoming exacerbated through digital methods, especially with forced digital moves such as “going cashless”. People’s citizenship was now even more in question than it has ever been, Anjali noted. The India Stack initiative for example had made it very easy for private sector players to get access to the Aadhaar database, without any proper checks and balances, or measures to regulate who had access to this data and to what degree of control. 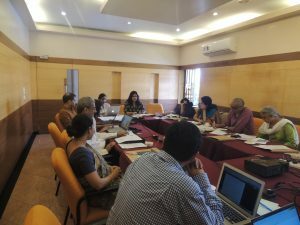 Himanshu Damle from the Public Finance Public Accountability Collective noted that there were several lacunae in our understanding of the data ecology, most importantly among them, an acknowledgement of its extreme malleability, which is in a state of flux. He observed that, “our approaches to governing data were in the past.” Data has been intensified, but regulation continues to be approached from a centralized point of view. He suggested looking at options that were more decentralized, such as block chains. Parminder Jeet Singh from IT for Change also stated that as a society when we were buying into new social systems, the longer term costs of this must be acknowledged to move forward on regulating the digital effectively, specifically with regard to striking a balance amongst the roles of state and corporates in different spaces – regional, national and international. New areas such as Artificial Intelligence and machine learning must be considered when thinking about effective policies to govern the domain. The round table served as a building block towards creating a consensus around some of the major issues in digital governance systems. In the second half, the strategies for action were discussed by the participants. First, the charter was recognized as an important starting point, and the need to take the work on it forward was also acknowledged as an imperative in the coming months. Connecting with other important networks and coalitions working in welfare sectors was also discussed as an important step. In addition to this, it was also decided that a systematic research study would be undertaken to establish a sound repository of credible and valid data on citizens’ experiences using Aadhaar and the JAM platform for service delivery, through surveys, interviews and public hearings.